Generally speaking, you can expect your child’s baby teeth to erupt at about 6 months old. This process continues until the full set of 20 baby teeth have erupted by 3 years of age. Fortunately, there are a number of things you can do to help your baby through this process. Take a teething ring and sit to chill in the freezer. Remove when cool, long before it’s frozen. Biting a teething ring will help alleviate some of the discomfort caused by teething, whilst the chilled temperature provides a mild numbing effect. It also helps to lightly massage your baby’s gums with a clean finger. Some over-the-counter teething gel can be helpful too, but it is always best to consult your health professionals or ask your local pharmacist beforehand. Cold food and liquids can help numb the pain and offer a soothing effect. The teething process can cause excessive dribbling. In turn, excessive dribbling can cause the skin on your baby’s chin and neck to become sore and dry. By taking a damp bib or cloth, you can help to alleviate this problem by mopping up excess saliva and dribble. Specially developed pain medication for babies may be used to alleviate pain and bring down a high temperature. If a raised temperature persists, see your doctor. As teeth begin to erupt, you can begin to introduce the first foods to your baby’s diet. Adult tooth eruption occurs when the preceding baby teeth exfoliate (fall out). Adult molars are an exception to this, as they erupt behind the back baby teeth where no exfoliation occurs. At roughly 6 years of age you can expect your child’s baby lower front teeth to loosen and fall out, to be replaced by the first adult teeth. 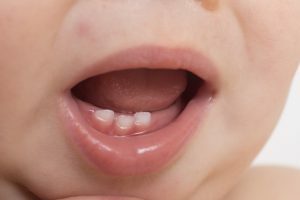 The ‘6-year-old molars’ usually erupt around this time as well, whilst the full set of adult teeth will continue to come through over the next 6 years. By the age of 12, you can expect that all 20 of your child’s adult teeth will have erupted, with the ’12-year-old molars’ making an appearance at this age, too. Wisdom teeth are the final teeth to erupt, although they do not erupt for everyone. This process can occur from anywhere between the ages of 18 – 25. It’s important to be aware that in some cases, a child will not develop the full set of 20 adult teeth. This is called ‘agenesis’. A relatively common occurrence, your dentist can determine whether your child has a full set of teeth by taking an OPG or a full mouth x-ray.